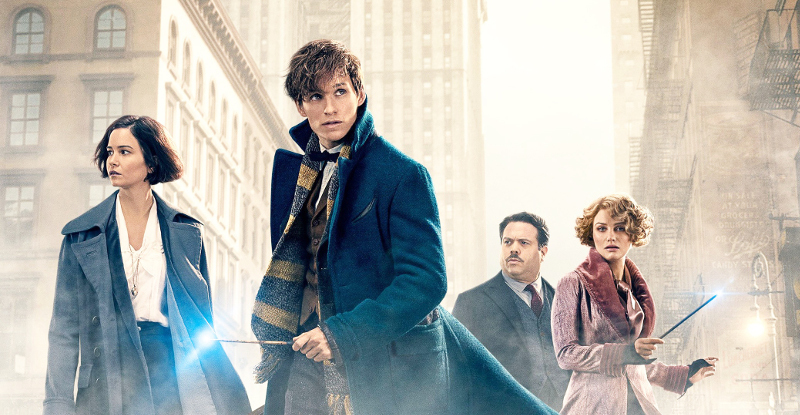 The latest film from the blockbusting Harry Potter franchise returns us to the magical world which engrossed an entire generation of children and no small amount of adults as well. ‘Fantastic Beasts And Where To Find Them’ is now showing now in Phuket. The action takes place in prohibition-era New York City. Eddy Redmayne plays the lead character , the wizard Newt. Newt scours the city for his escaped creatures. Fantastic Beasts and Where to Find Them offers a new story and new characters, and it looks at the wizard community from a different angle – and a different time period. Set in the jazz and prohibition era of New York City in 1926, the movie takes magical action across the Atlantic and away from the Potter-verse’s trademark English setting. The script was written by JK Rowling herself, and although she has exerted strong control over the screenplays adapting her novels, this is the first time she has personally written a movie script. It is directed by old-hand David Yates, who has long experience in the Potter franchise, having directed the last four Potter movies. The main character Newt Scamander (played by Eddie Redmayne) is magic-zoologist who is passionate about finding and categorising magical creatures from all over the world. He could be considered a kind of grown-up version of Harry Potter, which is an understandable direction to take the franchise in, given that many Potter fans are now themselves all grown up. As predecessor to Potter, Newt also studied at Hogwarts School, in Hufflepuff House, but he leaves his education behind to pursue his love of magical beasts and passion to protect them from humans that might wish to cause them harm. 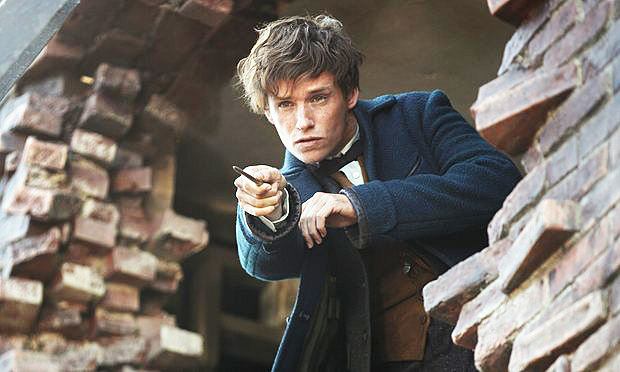 As we already know from the previous movies, Newt will eventually pen the book from which the movie takes its name, which of course, was later studied by Potter during his time at Hogwarts. Newt, a tweedy somewhat bumbling Englishman, travels to New York City with only his magical leather suitcase, which is filled with the magical beasts he has collected, including, among others, a furry black platypus-like “Niffler” with a knack for sniffing out treasure, and a giant Thunderbird that can sense danger and create storms as it flies, which Newt planned to release back to its native Arizona. His mission in America is to search out other scholars of the beastly world to confer with, and also to find and protect the beasts that inhabit the New World. 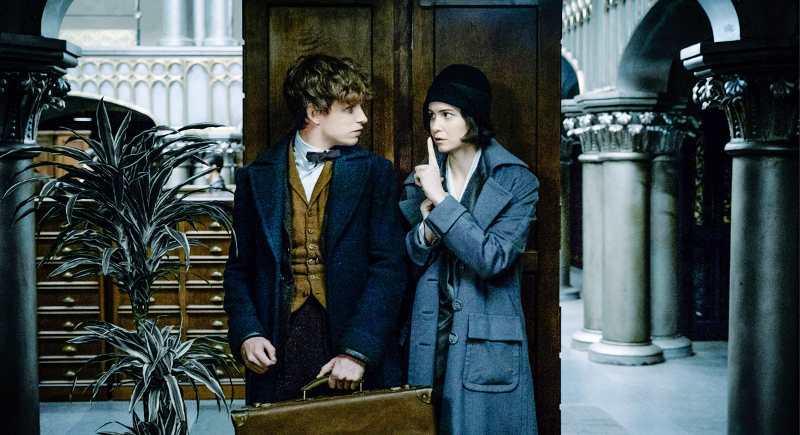 But, before long, an unforeseen and unfortunate occurrence befalls Newt when he accidentally swaps his suitcase with Jacob, a “nomaj” (an American word for muggle –a non-magic person) who before long allows many of the fantastic beasts to escape and begin to wreak havoc on the city. This chaos couldn’t come at a worse time as tensions are rising between the “no-majs” and wizards and witches in New York. Anti-wizard “no-maj” group The New Salem Philanthropic Society is led by the puritanical, hate-spewing Mary Lou Barebone (played to a tee by Samantha Morton) and are protesting in the streets against the wizards and the dangers they pose to ordinary people. 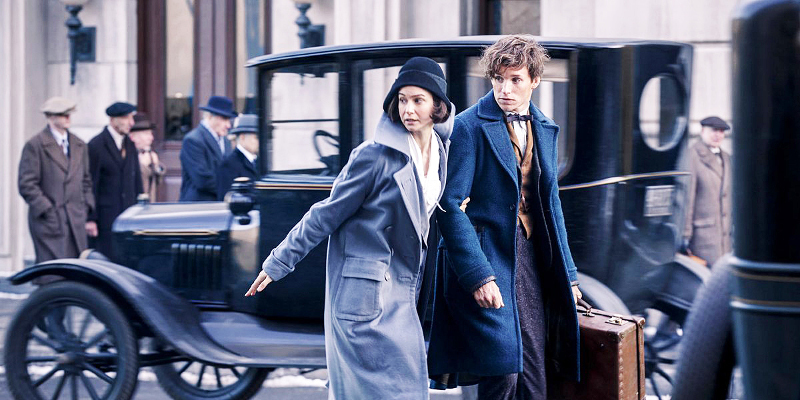 Meanwhile, Newt is tracked down and arrested by wizard official Porpentina Goldstein (Katherine Waterston), who works for the Magical Congress of the United States of America (MACUSA), and is looking to get back in her employers’ good graces. Porpentina tells Newt that all wizards must register their wands at the Wand Permit Office, lest they pose a threat to magical safety. MACUSA’s policy is to hide themselves from “no-majs”, but lately a dark force is threatening this anonymity by destroying buildings causing mayhem in New York. Newt is sent off on a merry chase to re-capture all the magical creatures before they cause more trouble, joined by his new “no-maj” friend Jacob, who provides some comic relief in the otherwise quite stern movie, and Porpentina’s flirtatious sister Queenie. This sets up the action scenes for much of the film, as they rush around New York trying to recapture the elusive and unusual creatures. With its adult characters, the movie also brings with it the adult themes of bigotry and intolerance. It certainly veers to the dark side of wizardry. Somewhat like the darker turn the later Harry Potter movies took, but much more explicit. It plays on the current Zeitgeist of racial intolerance and xenophobia in American culture and does its best to critique it, although the allegory does not quite hold water. We also catch our first glimpse of the new villain Gellert Grindelwald who, given that the franchise is signed up for another four movies, we will no doubt see more of soon. Overall, it is a fast-paced movie, which despite the need to begin the world-building plot and characters inevitably needed in the first movie of a franchise, it manages to keep the viewer interested. The fantastic beasts are realised very well on screen by deft use of CGI. People who are unfamiliar with the Harry Potter franchise movies may struggle to keep up with the magic jargon, so make sure you go with a Potter fan if you want to be brought up to date. Fantastic Beasts And Where To Find Them, starring Eddie Redmayne, Katherine Waterston, Dan Fogler and Colin Farrell. Directed by David Yates. Now showing at the cinemas at Jungceylon and Central Festival Phuket.